US OPEN champion Stan Wawrinka says he expects the reigning elite to dominate the spoils in grand slam tennis in 2017, but says Nick Kyrgios is a danger at the Australian Open. Wawrinka, 31, has won one grand slam title in each of the past three seasons, making his three career major crowns the most by any player since 2014 other than Novak Djokovic (six) and Serena Williams (five). Of this year's four major titles, Djokovic won the first two, with one each for Wawrinka and surprise world No.1 Andy Murray. "Andy and Novak have been strong to take those grand slams - in (2017) it's going to be a little the same,” said the Brisbane International second seed. Three of those four players, with the exception of Kyrgios, are seeded at the Brisbane International, which starts on Sunday. Wawrinka expressed doubts about whether both Kyrgios, 21, and Australian No.2 Bernard Tomic, 24, would find motivation to sustain a strong season at relatively young ages for top-10 men in the modern era. "He (Kyrgios) is an amazing player, going up and up and every year,” said Switzerland's world No.4 after his first practice session at Pat Rafter Arena. "His career is a little up and down. It's about his motivation. "If he has had a good off-season he's going to be hard to beat. The last few years he was always really dangerous. Asked if Kyrgios has respect of players for his behaviour aside from his tennis talent, Wawrinka said: "It's tough to say for everybody. For me, I see him as a really strong and tough player. 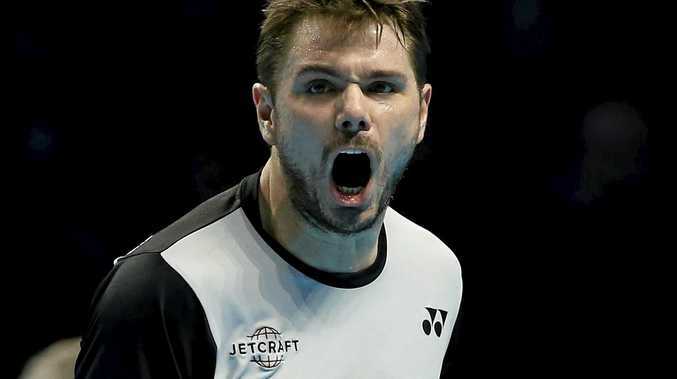 Wawrinka stonewalled a question about whether he harbours any feeling over Kyrgios's remarks during a 2014 match in which the Australian insulted his girlfriend, Croatian player Donna Vekic. "No, not that I know,” he said. Wawrinka said he knew Tomic, who is unseeded for Saturday's draw at the Queensland Tennis Centre, played especially well coming out of his pre-season training period each year. "It will be interesting to see if he can keep the motivation through the year,” he said. Wawrinka is a known January performer, having won the Chennai, India, title four times and the 2014 Australian Open final. Twice a winner in two attempts in a punishing grand slam final over the relentless Djokovic, the man with the best backhand in tennis has a theory why. "I know I can keep a level with him physically for five hours. I know I am strong,” he said.